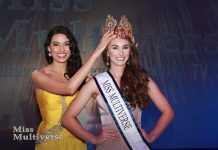 The representative of Kazakhstan took the third place in the contest Miss & Mrs Multiverse-2013 analogue Miss Universe ( “Miss Universe”), Tengrinews.kz reports. 24-year-old works as a model Kozedub 16 years. She speaks three languages – Italian, English and Turkish. According Kozedub, the invitation to the competition, she received a sudden, six days before the start of the competitive events. In addition, due to lack of sponsors girl had to take all the costs. Kozedub also said that the contest was held in the form of reality show, which aired on the channels in Europe and Latin America. During the competition the girls involved in the entertainment shows, swimming in the Caribbean Sea with dolphins, visited museums, exhibitions, soirees, and went with the children from the orphanage to watch the match of baseball.